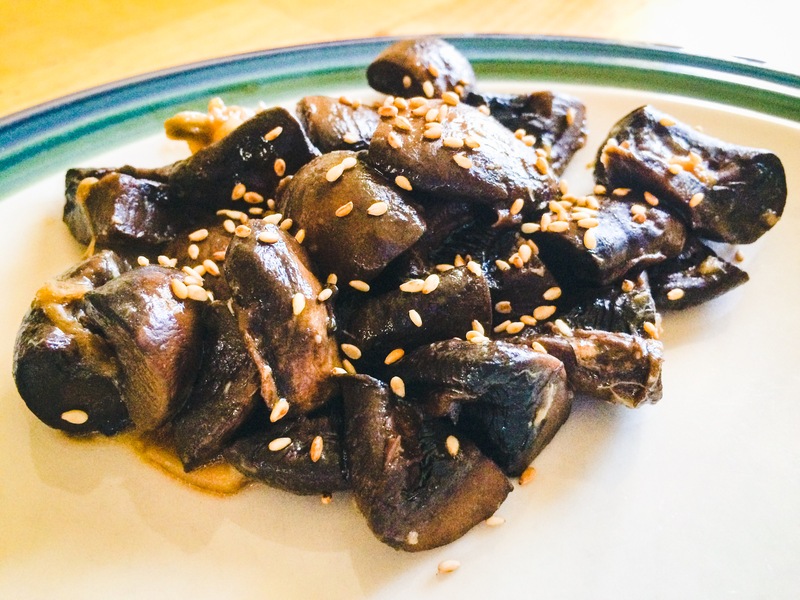 With a change of sauce and topping, these mushrooms went from the ground to being great! Well fans, I told you I made variations to two of my recipes and I finally have a minute to share. The first variation was for crock pot asian meatballs and this was the side dish I made to go with it! I’ve been trying to do some Asian-inspired dinners that don’t involve me picking up the phone and ordering fried, fried, sauced and steamed. I also wanted this dish to still be kid-friendly for picky eaters. So I took my favorite crock pot sassy meatballs and changed it’s regional origin and then took my crock pot garlic mushrooms and added a different sauce and topping! I learned from a Korean friend of mine that I can make a very basic sauce out of three ingredients, put it on almost anything, and it will taste awesome. And indeed, she was right! I’m also convinced that mushrooms can taste good covered in just about anything. So I pretty much made these mushrooms according to the original recipe but without all of the seasonings. Add the sauce and sprinkles and be good to go! Put mushrooms in crock pot first, then all of the seasonings and garlic. Put the stick of butter on top as the last step and then put the lid on. No mixing is necessary. Do not add sauce yet. Cook on low for 5-6 hours. Combine the three sauce ingredients in a separate bowl. Remove the mushrooms using a slotted spoon and then toss in the sauce just before serving. If you wish, you can decorate the mushrooms with the roasted sesame seeds just before serving.